I was in NY for about 10 weeks, and I was very lucky to have 3 sets of visitors from home and seeing some familiar faces is definitely something I'm going to miss on my European leg. It was my birthday last week and I was especially fortunate to have a couple of good friends visit so we could celebrate Alberta-style. By the time they made it down, I was already a well-seasoned tour guide, so I was able to become the mayor of several places on foursquare... something that gave me a lot of nerdly pleasure. I was also able to knock a number of things off my to-do list, including: have a NY bagel, skate at Rockefeller Center, have a cupcake from Magnolia Bakery, visit the Guggenheim Museum, go to a fancy NY nightclub, eat NY cheesecake, and go to Tom & Jerry's bar. The last thing on the above list was the first thing that we did. Over the course of my trip Yelp! had become something that I'd come to rely on to find great places to go. The reviews for Tom & Jerry's was pretty much the kind of pub that I was looking to find in NYC. It delivered. 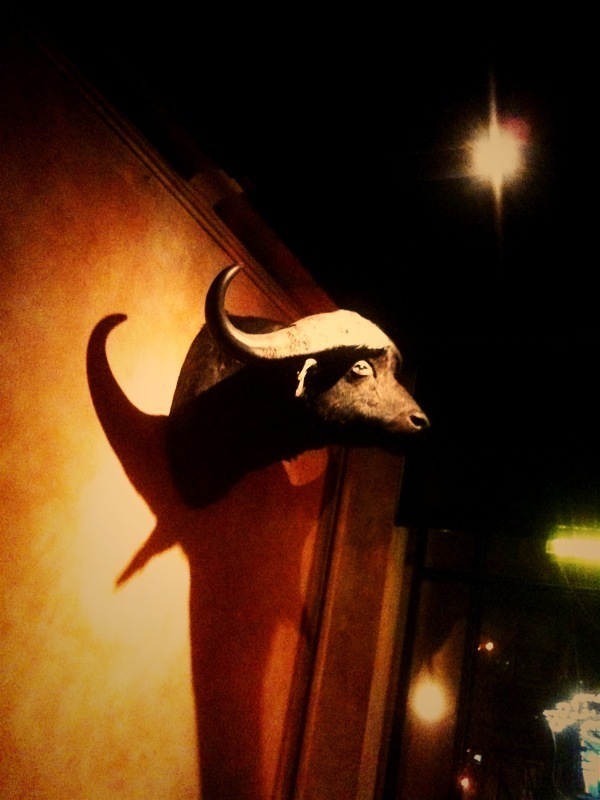 There were several large animal heads on the wall, which I found interesting, and had an atmosphere similar to the Black Dog in Edmonton. We did a lot of bar hopping that night and 2 of us got good and drunk... my other friend is pregnant, so she is an unbelievable saint to let us be hammered well in to 3 of their 4 nights there. ate a falafel at Mamoun's... which was my second home in NY. At the end of it we realized that we lost their camera at Cafe Wha? so it meant that most of the evening was lost with it (although I got a couple with my iPhone which I've posted below). The next day the camera woahs continued as I fell while skating at Rockefeller Center & broke my zoom lens (the rental place only gave out figure skates... the toe picks are my excuse). Aside from the camera mishaps the rest of the visit was solid with a trip over to Brooklyn for some Grimaldi's pizza and a pub find in the Lower East Side that topped Tom & Jerry's: 2A. Below are a couple of the photos from my iPhone.